Digital Lace is a digitally-activated light and colour-changing textile sampler on a wooden frame measuring approximately 130cm wide, 15cm in depth and 75cm in height, and takes inspiration from rare, 17th century lace samplers held at the National Museums’ Collection, Scotland. The concept for the piece was one of six proposals selected for the Expert Workshop: Rejuvenating Craft, Plymouth College of Art, (2014) which presented an opportunity to develop a product through the use of new technologies and to explore hand craft processes alongside digital technologies. This was subsequently presented at the European Crysalis Project closing event at TIO3, Belgium. Subsequently a new iteration of Digital Lace was one of seven, digital exhibits selected for the first V&A Dundee’s Touring Exhibition, Design in Motion, a showcase of contemporary designers who use digital technologies to reimagine traditional heritage. 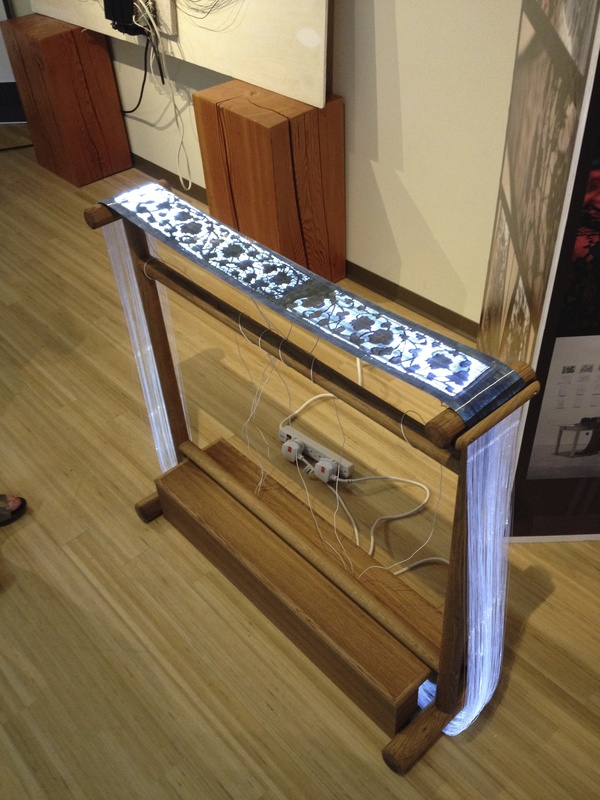 The exhibit comprised: a Digital Lace sampler with two handling samples. The piece was designed as a reverse colourway (on black background) and was developed with distinctive lighting and colour-change sequences. The exhibition toured for 17 weeks with visits to 85 venues across Scotland including rural locations such as Harris, Campeltown, Elgin and Galashiels as well as Edinburgh, Glasgow, Dundee and Aberdeen with the final stop at the Victoria and Albert Museum, London. A film (displayed on 10m screen) and a large-scale banner of a close-up image of Digital Lace are now represented as part of the permanent display in the new Fashion & Style Gallery, National Museum of Scotland (2016).